Maybe it’s time to stop sweltering during the summer and install your first central air conditioning system in your home, office or retail establishment. Or perhaps your home or business has been limping along with an outdated HVAC system that needs to be upgraded, extended or replaced. Either way, Bloomfield Cooling, Heating & Electric’s technicians will install the best A/C system for your space, neatly and efficiently. We install and service central (whole house) air conditioning and ductless air conditioning systems, custom ductwork (rendered in our own in-house sheet metal shop), and programmable thermostats. We offer a range of maintenance and service contracts for residential and commercial air conditioning and heating systems. Challenging space? 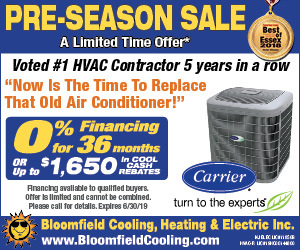 Call Bloomfield Cooling, Heating & Electric. Depending on your physical space, our expert installers can conceal ducts, piping, wiring and HVAC equipment in attics, crawl spaces, walls, closets or basements. We love a challenge! Our skilled metal craftsmen can design ductwork made specifically for any home or office, especially for cooling or heating installations that are out of the ordinary. This customized ductwork can be installed without disturbing the integrity of your space. Whether it’s a new installation, extension to an existing area, or a just additional airflow to one room, we can easily accommodate your needs. As leaders in all things air conditioning and heating, Bloomfield Cooling & Heating will recommend units with new technologies such as the scroll compressor, that will help keep your system running more efficiently with less drain on the power grid and your utility bills. With fewer moving parts, the scroll is quieter to operate and will last longer than conventional piston compressors. Our professionals will also explain everything they are doing and give you a thorough walk-through of the new central air conditioning system upon completion to make sure you understand how it works. Our HVAC professionals also provide air conditioning leak detection. We also take pride in being extremely clean and organized. Our crew understand they are working in a finished space that deserves white-glove treatment. They will remove all old equipment and materials for you, wear special shoe coverings to protect your flooring, keep the surroundings free of debris, and clean up so well afterwards that you’ll never know they were there… except for the fact that you, your family or your staff will be much more comfortable during the hot weather. So don’t settle for a clunky old system that’s not cooling your house or your commercial building, and don’t pay more in energy bills than you should. 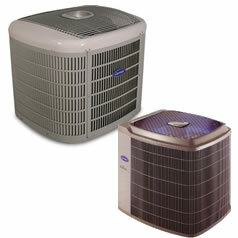 Call Bloomfield Cooling, Heating & Electric instead and let our crew take care of your air conditioning needs.